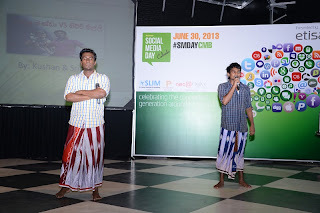 Despite the occasional “Ratification” [A new social media word invented at #SMDayCMB - Don't think literally, but metaphorically] inside the venue, the Social Media Day 2013 event was an overall success according to many people who attended it, and then gave their honest feedback. When I say “honest feedback” I’m not only counting the ones who simply told us ‘good jobs guys’, but also counting the ones who gave some seriously valuable constructive criticisms. As I set out in my opening note for the event, we deliberately wanted this event to be very casual and unstructured in its format. After all, the event was about ‘Social Media’ and the inherent nature of Social Media is; it is casual, it is unstructured, and it is nonconforming to what your typical event adviser would consult you to do. “The ideal event format” we (the organizers) had in our mind was, something a little more objective driven than a casual Tweetup, and something a far less serious than a ‘Social Media Marketing Conference’ which would typically be held at a luxurious hotel. We wanted to keep the casual and friendly environment of a Tweetup, (Yes, folks were allowed to come in shorts!) and the content and outcomes of a conference (presentations, panel discussions). We definitely achieved the first objective in my opinion, but I agree with some critics, that we would have done it better with the second objective. Our mission for the concept of #SMDayCMB is, “to build a platform to recognize remarkable people and organizations on Social Media domain and inspire rest of the community to action their own remarkable ideas”. In short, we want you to take some action, to initiative something driven by Social Media, after you go home from #SMDayCMB. Last year we connected JehanR on a Google Hangout and by that time he was the only prominent Sri Lankan video blogger we could recognize on YouTube. When we announced “JehanR is coming to Social Media Day 2012”, some people asked me “who is JehanR?”. One year since then, JehanR has become a household name in most Colombo homes, many Radio stations are now adapting Jehan’s "mom style" on their morning shows, and people are now dieing to find a seat if someone tells “JehanR is coming for an event in Sri Lanka”. Of course it all because of his talent, no doubt about it and he thoroughly deserves it. At the same time, we are humbly honored to be among the early ones who recognized his talent, before any other mainstream media in Sri Lanka recognized him. Today we see, many rising YouTube starts from Sri Lanka who got inspired by JehanR. Yes, that’s what we want to see. Like Indi.ca inspired (and supported through Kottu.org) a generation of young bloggers in Sri Lanka, like Kalinga and the gang inspired the Sinhala bloggers, we want to see more Sri Lankans to adapt Social Media and start doing something different, something remarkable. In our opinion, that’s the best way to answer the critics who keep complaining “Social Media is a fad, Social Media is for the immature kids”. One of the best things I noticed in this year’s Social Media day was recognition of Kushan & Srimal by the Colombo community. Kushan & Srimal were on YouTube for quite a some time now, but their talent was never been noticed by the Colombo based Social Media community. This was mainly because, the duo is from Avissawella, and their work is mainly in Sinhala language. We spotted the duo and we recognized their talent and we decided that they needed to be featured at this year’s Social Media day. Just as people questioned us “Who is JehanR?” last time, this year people criticized us for choosing "Cheap Assets" for Social Media day. But we knew we made the right choice, and the crowd response to Kushan & Srimal at the event proved that we were right. Mission accomplished…. We recognized the raw talent, we showcased them, and next step is seeing some more people following the footsteps of K&S and starting their own YouTube work. Make a note of this… When we come for the Social Media Day 2014, there will be lots more people to praise K&S (may be including the ones who condemned them to be 'cheap assets') and may be a few mainstream media stations to use their work free of charge. This is something we need to address at a different level. When innocent youngsters showcase their creativity and talent FOC, there are people who misuse and steal their talent for commercial benefits. If you talk to any young people like them, they’ll tell you “අපි මේවා කරන්නෙ සල්ලි බලා ගෙන නෙවෙයි. නිකන් ජොලියට” (We are not doing these stuff for money, we do it just for fun). However, there are other people who will always take advantage of that ideology of people like K&S, and use their work for commercial benefits, without paying anything back to the creators. At the end of the day, they become instrumental (FOC) in someone else's commercial process. Yes, this should definitely be a topic of discussion at all Social Media forums. We introduced ‘Social Media Awards’ as an experiment in this year’s event. This is the first time in Sri Lanka (correct me if I’m wrong) such a recognition was given to people/organizations who contributed to Social Media in Sri Lanka. May be it’s a ‘world’s first’ to have ‘Meme Awards’ for real. However, it was totally an experiment and the winners were selected based on some basic criteria as view counts and subscribers on YouTube, Kottu.org Spicyness index, and remarkable projects we noticed in the recent past. Next year, we plan to expand this idea of “Social Media Awards” a little bit more, and we plan to adapt a ‘Community Nominations’ system to get entries shortlisted and an appointed judge panel to make the final call on award winners. This by no means, will degrade the validity of the remarkable people who won it this year. They all deserve the titles of those awards under any selection criteria for those awards.